Following increasing health facility utilisation of key health care services, Lagos State Government has procured N2.5 billion worth health equipment to boost the delivery of qualitative healthcare in the state’s General and Teaching Hospital. Dr. Jide Idris, the state Commissioner for Health who announced this at a press briefing at weekend, in Ikeja, said that the move is to meet progressive increase in the health facility utilisation trends for essential healthcare services. Idris, also said that the efforts is directed to improve the quality of healthcare in the state’s secondary, tertiary and health facilities. He noted that the equipment which included General Out-Patient Department (OPD) equipment, Anaesthetic equipment, Theatre equipment and Laboratory equipment would also enhance provision of qualitative care comparable to the ones available in developed countries. “These huge investments in infrastructural upgrade and procurement of equipment in the health sector will help foster an enabling environment for the implementation and take-off of the much awaited Lagos State Health Scheme (LSHS) which will ensure that residents have unfettered access to qualitative care,” he said. 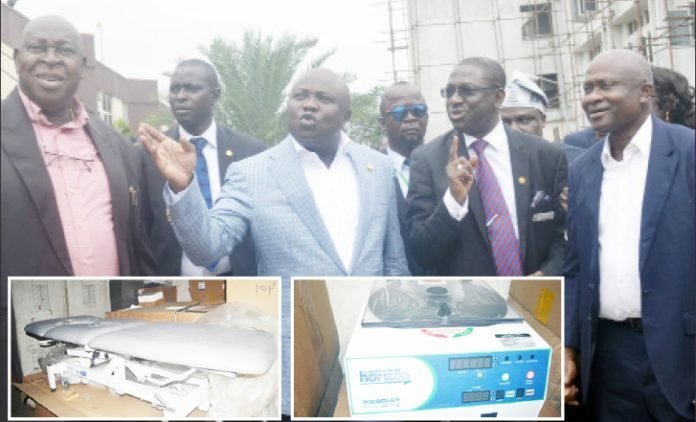 Idris highlighted the infrastructural development projects embarked upon by the Ambode-led administration in the health sector to include the construction of helipad at the Lagos State University Teaching hospital (LASUTH); purchase of 20 Mobile Intensive Care Unit (MICU) ambulances; purchase of 26 transport ambulances, power generators and mobile x-ray machines for all the secondary and tertiary health facilities. Other infrastructural upgrade embarked on according to him, are: The installation of additional mortuary refrigerators at Ikorodu and Mainland Hospital Mortuaries; completion of the renovation and upgrading of Epe General Hospital which involves renovation of theatre complex, X-ray, Laboratory, Pharmacy, Out-patient Department and Accident & Emergency unit. The Commissioner added that renovation works were also carried out in phases in several General Hospitals within the state with phase one involving Apapa General Hospital, Epe General Hospital and Mainland General Hospital. Phase II included renovation works at Orile-Agege, Agbowa, Gbagada and Ikorodu General Hospitals and Lagos Island Maternity Hospitalwhile Phase III included renovation works at LASUTH Ikeja, Badagry, Alimosho and Surulere General Hospitals, Accident and Emergency at Toll Gate, Ijede Health Centre and Ketu Ejinrin Health Centre. “This is especially pertinent with respect to the health needs of various population age groups with a resultant overstretching of the resources and capacity of the existing public health facilities requiring urgent but multi-faceted strategic interventions. “It was in this context that strategic infrastructural development of the health sector, upgrading of the existing facilities to a reputable standard and provision of key equipment was embarked upon by the State Government,” he said. Idris added that the effect of infrastructural development in the health sector by the State, aside from enhancing the efficiency of the health workforce and increasing the scope and quality of service delivered at the health facilities was geared towards ensuring that Lagos State emerged as a prime global destination for persons in quest of qualitative medical care. “With an unwavering commitment towards enthroning an efficient and effective system for healthcare service delivery in the State health sector in line with international best practices, Mr. Akinwunmi Ambode, the Governor of Lagos State also graciously approved the Global procurement of equipment necessary for the delivery of qualitative healthcare in Lagos State Secondary Healthcare Facilities and the Lagos State University Teaching Hospital (LASUTH) in 2016 with the objective of upgrading healthcare service delivery in the State public health facilities for the optimum benefit of Lagos residents,” he stated. Idris said the contract for the procurement of the equipment was subsequently awarded to four contractors via a competitive bidding process in compliance with the Public Procurement Law of Lagos State. The scheme will reduce out of pocket expenses on medical care, promote access to qualitative health care, reduce incidence of chronic diseases as citizenry will be encouraged to present earlier as financial barrier to positive health seeking behaviours would have been removed, he argued. Idris appealed to the end users, which are the health workers to put the equipment to good use and ensure that they were well maintained, protected and preserved to serve the purpose of which they were procured for.